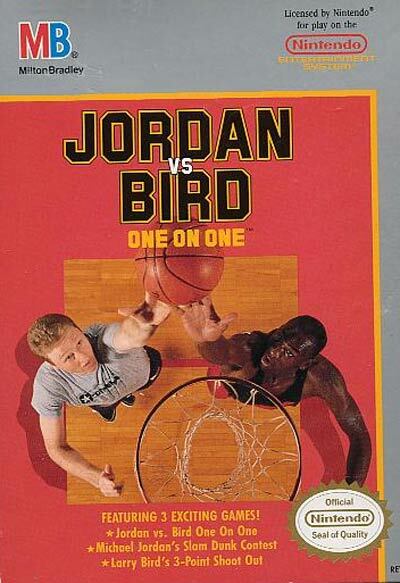 Published by: Milton Bradley, 1993 | Developed by: Rare, Ltd. / Rare, Ltd.
Jordan vs Bird: One on One was a 1988 basketball video game for the Mega Drive/Genesis, the Nintendo Entertainment System, the Commodore 64, and the PC. It was the sequel to One on One: Dr. J vs. Larry Bird. Michael Jordan of the Chicago Bulls and Larry Bird of the Boston Celtics were the main characters in the game, which allowed the player to participate in a one on one basketball game. Mini-games included a slam dunk contest (utilizing Jordan) and a three point contest (utilizing Bird).